Director On Call — 2015 FSAC Convention in Lake Louise a Huge Success! 2015 FSAC Convention in Lake Louise a Huge Success! Another Successful Funeral Service Association of Canada Convention! The 2015 FSAC Convention was held in beautiful Lake Louise, Alberta on June 8th-11th. Our Sales ManagerLinda Murphy-Kreimeswas there representing Director On Call and had a great time! Great attendance this year with lots to learn and enjoy! The picturesque Fairmont Chateau Lake Louise accomodated this years attendees. Speakers at the event included Robert M. Boetticher Jr. of the Cremation Association of North America, Philip Jones, Justin Zabor, Codi Shewan of EverLearn Associates, Jeff Weafer, Linda Stuart of Life-Cycle Celebrant and Linda Lee. 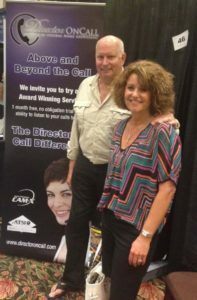 Linda Murphy-Kreimes was able to see lots of Director On Call clients this week including Dale Martin of Martin Bros Funeral Chapels & Cremation Services in Lethbridge Alberta (pictured with his wife Colleen). He stopped by the Director On Call booth to say hello and compliment the Call Specialists on the great service they provide his locations. Linda had this to say about the Convention: "It's been nice to reunite and meet new people and the weather has been perfect and the location was superb!"